The Spongebob Movie: Sponge Out Of Water opened in America to a mammoth $56 million opening weekend. It's pretty surprising that the second movie spin-off of a series that started 16 years ago can still generate such interest. But it also proves something that animation fans have known for some time- you don't need Hollywood A-listers to make an animated movie succeed. It's true the new movie features Antonio Banderas and live-action segments, but the film is headlined by original Spongebob voice-actor Tom Kenny (alongside the rest of the cast of the TV show). And frankly, it's time for Hollywood to learn. Since the much-missed Robin Williams signed on to voice the Genie in Disney's Aladdin, the conventional wisdom is that a starry voice-cast is a necessary ingredient in modern animated features. Gradually it's even shifted to the point where in many cases every single major role is filled by a big name. Pixar- and Disney Feature Animation more recently too- have taken a slightly different tactic. Although they still cast known actors, they have always favoured the right person for the part over the bigger names. After all, where else will you find Patton Oswalt or Ed Asner headlining a $100+ million film? On the other hand, other studios have been much more guilty of so-called Stunt-casting, where major names are cast to attract more attention. At one time Dreamworks Animation was particularly associated with this practice- with (as in so many ways) Shark Tale being the nadir. Martin Scorsese may be a legendary director, but voice-actor he is certainly not. The logic is sound, from a purely business point of view. The thinking is that children will be attracted by the animation, but parents and other adults will be drawn in by the big names. You get to stick them on the poster and send them out for the publicity. But was anyone going to see Megamind because it was "a Brad Pitt movie?" I'm not convinced. The problem with this practice is that it shuts out professional voice actors. In the TV animation world, anime dubbing and video-game community there are a high number of extremely talented people who make a living from voice acting. Although some of them also occasionally act on screen as well, they have developed a particular skill in the area of voice-over. Many of them like Kenny, Billy West, Steve Blum, John DiMaggio, Tara Strong and Debi Derryberry have hundreds of credits to their name and have developed a following of their own. Some such as the legendary Rob Paulsen have been doing it for 30 years or more- these are people at the top of their game. It's a great shame that with theatrical animation now a bigger deal than ever before that they are being almost completely shut out. On the flip-side, plenty of actors who are perfectly decent on-screen actors have turned in voice performances that are somewhat lacking. Acting with the voice alone is a particular skill, and not everybody has it. To take a recent example- Cate Blanchett in How To Train Your Dragon 2. Blanchett has turned out some phenomenal on-screen performances over the years but in all honesty she brings little to the role of Val. I'm in no way suggesting that Hollywood stars should never voice animation. Occasionally a particular actor bring a character to life in such a way it's hard to imagine anybody else in the part. But other times they bring nothing to the part other than their name on the credits. The best person for the role should get it- whether they're a big name, voice actor or even an unknown. The practice of stunt-casting animation-at the expense of the cream of the voice-acting community- needs to stop. 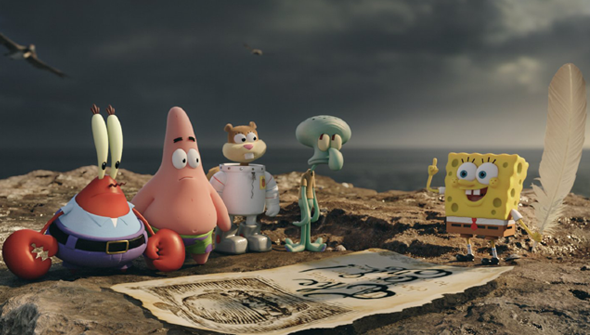 Hopefully The new Spongebob Movie's success will help Hollywood finally see the light. Although I won't hold my breath.